Going on a hike far away from everyday commotion can be a fantastic experience. However, your trip requires some planning too. You need to think about what you plan to bring with you in your hiking backpack, but how you are going to find your way and reach the desired destination. Sure, some trails are marked well, but sometimes we find ourselves in unfamiliar territory. Getting lost can be a very serious problem, and even put you in danger. 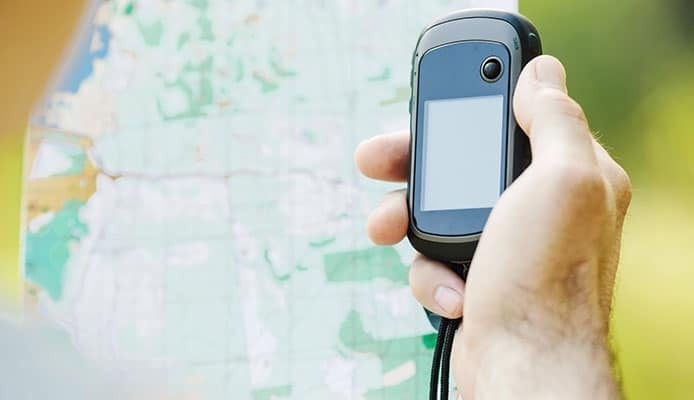 For this reason, many hikers take a GPS device with them when they go on the trail. This device makes the hike much easier, since you will always be aware of your location and which obstacles lie ahead. You will also be able to plan routes, save waypoints and share this data with other participants. Some GPS devices give you just the basic information and have simple functions, while others are more sophisticated and include numerous useful functions and additional features. Finding the best backpacking GPS depends on your preferences and intended use, as much as on the product itself. We selected some great products for you to choose from, and also compiled a buying guide to give you some pointers on what to look for when buying, so don’t miss out. 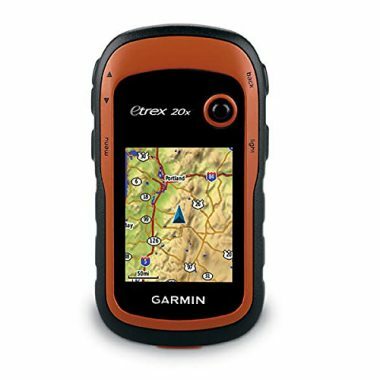 Garmin is probably the best known GPS manufacturer, and we start off with their 64s model. It offers fantastic value for your money and comes packed with features. When buying this product, you have several versions to choose from – a base model, one of the versions with wireless connectivity, or a GPS equipped with a camera. It’s a button-operated device with a 2.6-inch screen. The screen displays 65k colors in a 160x240px resolution, and it’s easily readable even in direct sunlight. It’s a fairly compact device, and weighs only 8.1oz including the batteries. While we’re on the subject of batteries, this top rated backpacking GPS works with both disposable and rechargeable batteries. It can use two standard AA batteries, or an optional rechargeable NiMH battery pack which can also be charged while inside the device. If you choose this Garmin GPS you will get 4GB of internal memory to store all your maps and additional data. Furthermore, you can expand the memory with a card. As for additional features we mentioned, this product has wireless connectivity via Bluetooth and ANT+. You can connect it to other Garmin devices to exchange data, or connect it to your Apple product and receive smart notifications. The device comes with a 3-axis compass as well as a barometric sensor which allows it to measure altitude. As a bonus, you get more than 250 thousand pre-loaded caches, along with BaseCamp software which allows you to organize your maps and plan your activities. It’s truly an excellent device which is compatible with many different map types. When you consider the top-notch build quality, it becomes obvious why it's so popular and well-received among users. 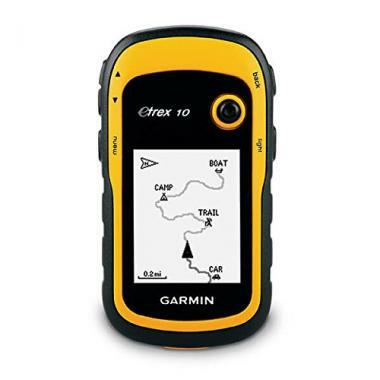 The Foretrex 401 is something different, since it’s not a handheld GPS like others on this list. It comes with a strap so you can mount it on your wrist. This is convenient since you can look at it as you would look at a watch, while your hands remain free. Like the previous one we talked about, this one is also fairly basic when it comes to design. It comes with a monochromatic LCD display, which is easy to read. It’s operated using the buttons on the bottom, and the user interface is very good. You can calibrate it easily, and it also allows you to change the units of measure if you need to. 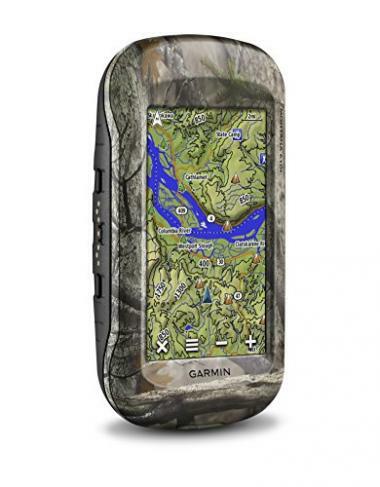 As for additional features, it comes with a trip computer, sunrise/sunset times, hunting and fishing info as well as an electronic compass and a barometric altimeter. The trip computer allows you to create and store routes, track your movement and save points of interest. This walking GPS requires two AAA batteries to work, and you can expect them to last up to 17 hours. The package includes a USB cable, for connecting it to your PC and loading the maps. 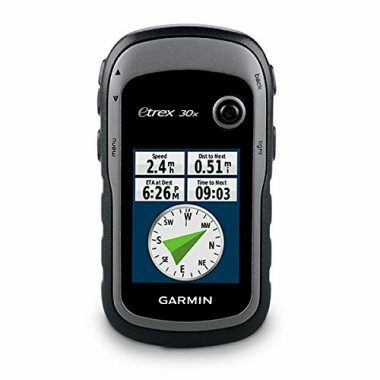 It’s slim, lightweight and waterproof, and should be considered if you don’t want to carry the GPS in your hand. If you’re looking for an affordable GPS, this is an great choice since it’s the most budget-friendly option in our hiking GPS reviews. The functions are pretty basic, but it’s reliable and very good at what it does. As you can see, it’s also made by Garmin. The design is interesting – it has a yellow and black body with a 2.2-inch monochromatic display in the middle and operation buttons are located on the sides of the device. The display is very visible no matter the light conditions. It runs on two AA batteries, which is a plus because you can quickly replace them at any moment. A new pair of batteries will give it a runtime of about 20 to 25 hours, depending on the backlight level you set. The reception on this compact device is fantastic, thanks to WAAS-enabled GPS receiver as well as GLONASS support. It is able to find your position very fast, and you can rely on the accuracy. It can store waypoints and keep track of your routes, so you can go back to it if you need it later on. In addition, this GPS supports Geocaching too. As with other Garmin products, you get their BaseCamp software to easily manage maps on the device. However, it doesn’t have additional connectivity options or sensors, and you can only transfer data using a USB cable and your PC. It's very rugged and resistant to damage. In addition, it’s made according to IPX7 waterproof standards which guarantee it will work without problems even in wet conditions. 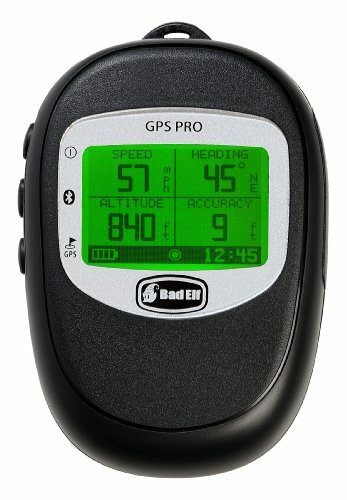 This GPS from Bad Elf is powerful and compact at the same time. Measuring only 3x2.5x0.7 inches, it won’t take any unnecessary space. In addition, at 3.2oz it’s really lightweight too. However, the small size doesn’t mean it’s an inferior product in any way. It works really well to bring you loads of useful information such as latitude, longitude, altitude, heading and speed. It also has a clock and a battery level indicator on the display. Furthermore, it has the ability to record more than 100 hours of position logs. The screen we mentioned is easy to see, but isn’t very sophisticated. It’s a monochromatic screen with a nice backlight so you can look at it in low-light conditions too. This unit comes with a rechargeable Li-ion battery, which has an exceptionally long battery life – up to 35 hours. What’s nice is that this GPS is fully compatible with Apple devices, and you can even download a free app for iOS. It can connect to and share data with up to 5 devices at the same time, using Bluetooth connection. In addition to wireless connectivity, it’s also equipped with a radio receiver. Operating the 2200 GPS Pro is very simple using the buttons on the left. They also allow you to easily customize units and settings. Finally, it’s made of strong plastic and has IPX4 waterproof rating so you can count on it to be durable too. 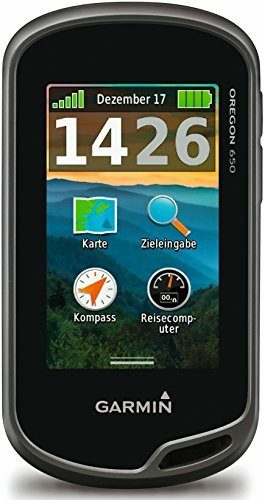 The Oregon GPS comes in two versions –the basic 600 model and the 650 model which comes equipped with an 8MP digital camera. In addition, you can buy each version with or without preloaded topographic maps (models with maps have t in their name). You also have several choices when it comes to internal memory. Even though it’s a bit pricey, it comes packed with great features. It’s equipped with a large touchscreen with multi-touch function. The display can work both in portrait and landscape modes. Buttons on the display can be customized, so you have shortcuts to features you use most often. The dimensions are 4.5x1.3x2.4 inches, and at 7.36oz it’s fairly light for this type of device. When it comes to power, you have two options – either use a couple of AA batteries, or a rechargeable NiMH battery pack, which is included with some models. This device uses dual satellite positioning – both GPS and GLONASS, to bring you excellent accuracy. To further improve this, it’s WAAS-enabled too. There are three sensors built into the product – a 3-axis compass, an accelerometer and a barometric altimeter. You also have Bluetooth and ANT+ wireless connections at your disposal. Even though some models come with maps, this product is fully compatible with third-party maps so you can use any map you like. It’s a really well-made device which is worth investing in. The eTrex 20x is a very popular product among hikers, for many reasons reasons. It’s equipped with a 2.2-inch display with 65K colors, which is easy to see in sunlight. The device comes with 3.7GB of internal memory, but also has a MicroSD slot so you can expand it. It’s preloaded with a basemap with shaded relief, but you can use it with a large variety of maps you load yourself. This equipment uses dual positioning systems (GPS and GLONASS) simultaneously, and pinpoints your location very quickly. It’s very easy to use, and the buttons are easy to press even with gloves on. The build quality is excellent, as it easily withstands dust, dirt, humidity and water exposure. This product uses disposable alkaline batteries, which are easily replaceable on the go. It’s a great choice if you’re looking for a compact device which gives you a balance between price and functions. Here we have a product which is an improved version of the previous one we talked about. It also features a 2.2-inch display with 65K colors, and a resolution of 240x320 pixels. This device measures 2.1x4x1.3 inches meaning it easily fits in the palm of your hand. It comes with 3.7GB of internal memory, expandable with a memory card. A worldwide basemap is already loaded on the device. The difference compared to the previous product are the sensors inside, as well as more connectivity options. It has a built-in 3-axis electronic compass to reliably show direction, and also a barometric altimeter so the device can display elevation. 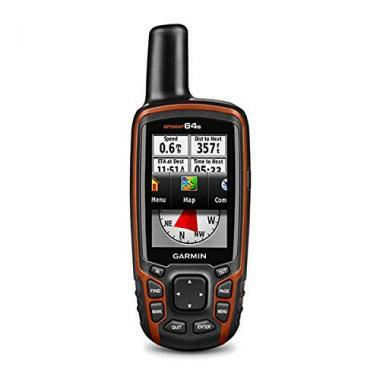 It uses a wireless connection to pair with other Garmin devices and quickly share waypoints, tracks, routes or geocache information. There is also the possibility to store much information about your route, location, terrain and various hints. It’s equipped with a sensitive receiver which works with both satellite systems at the same time, to show your position even in deep or covered areas. Overall performance is excellent, including the battery. The product is waterproof and tested in rough conditions, so you really don’t have to worry about durability either. 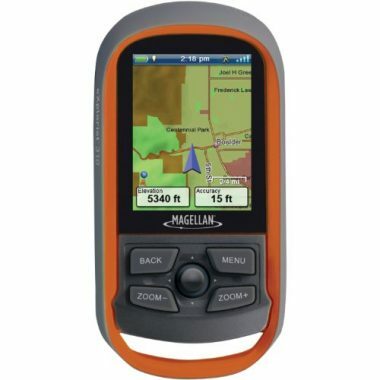 This is a very nice GPS unit from Magellan which can serve as an alternative to Garmin products if you want to try something different. It’s a button-operated device, with a 2.2-inch color LCD display. The screen looks good and you can read it easily in any light condition. The eXplorist 310 is a high-sensitivity SiRFstarIII GPS receiver, which also uses several aiding systems to bring you best accuracy possible (up to 3 meters). It uses two AA batteries, which can last up to 18 hours. You will get 500MB of internal memory on this device, and it’s preloaded with World Edition map (detailed road network, water, urban and rural areas as well as shaded relief). It also has sensors which allow it to show speed and elevation. Overall, the unit is easy to use, and the menus are very intuitive, so it’s definitely worth giving a try. The Montana is a fantastic product which comes packed with features. The thing we liked most is the screen – it has a color display with a 4-inch diagonal. The device supports dual orientation which adds to the versatility. In addition, it supports operating with gloves too, which is convenient. The product uses both GPS and GLONASS satellites, and combined with some aiding systems it pinpoints your position with remarkable accuracy and does that very quickly. Besides location, it shows altitude (thanks to the barometric altimeter), and also shows direction using the 3-axis compass. 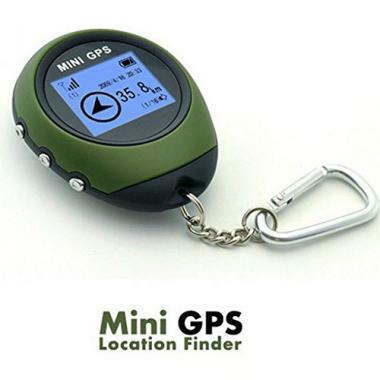 You will get this GPS preloaded with U.S. topo maps (100k), and with more than 250,000 preloaded geocaches so you can join the fun immediately. As a gift, Garmin gives you a 1-year subscription to BirdsEye satellite imagery, as well as their BaseCamp software for PC. It allows you to organize maps, plan routes and waypoints, and share all of that with your friends. The battery life on this product is great considering the screen size, and you can expect it to last between 16 and 22 hours. The casing is sturdy, well-made and feels good in your hand, and the camo print looks great. With all the features it brings, we think it justifies the higher price tag. Winterworm has designed this GPS to be as compact as possible. No bigger than your regular wristwatch, it won’t take up any unnecessary space. In addition, it comes with a chain and a carabiner so you can attach it to your keys and always have it with you. It’s very easy to use there are three small buttons on the left which navigate you through the menu. You can set your destination point, and the device memorizes up to 16 points. It will also track your route and record distance and mileage you covered. You have information about longitude, latitude and altitude at your disposal at all times. In addition, it displays velocity too, which is a nice touch. You can set the device to use imperial or metric units, whichever you’re used to. 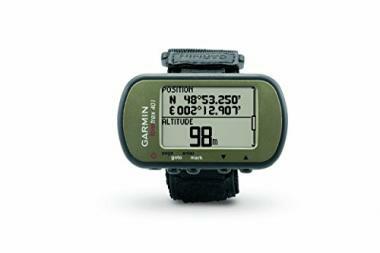 This mountaineering GPS comes with a digital clock with adjustable timezones, as well as date. As for build quality, it’s made of strong ABS plastic to ensure durability. It works well in all temperatures (-20 to +50°C) so it won’t leave you stranded. However, keep in mind that the start-up time can be a bit longer in cold weather. It is powered by a built-in rechargeable battery which will last up to 12 hours of active use, and more than two days in stand-by mode. You charge it using a USB cable which the manufacturer provides in the package. What’s interesting is that you’re going to get the GPS in a random color, most likely green. It’s a great little unit that you can rely on to find your position quickly. Choosing a good GPS for hiking shouldn’t be all that difficult, as long as you know what you’re after and keep a few things in mind. This is a device that needs to be functional and reliable, since you depend on it to show you the way. 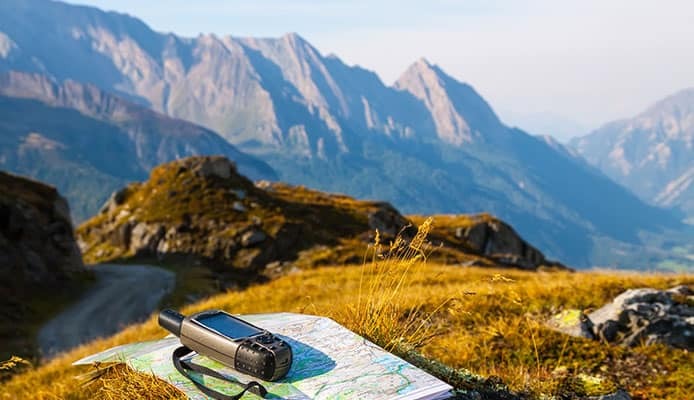 Ease of use, long battery life, quick positioning and compatibility with various maps are just a few things the best hiking GPS devices need to have. Take a look. This is one of the most important things to consider when choosing your portable GPS for hiking. Unlike other devices we use every day, we won’t have the opportunity to charge the GPS device often. Running out of power when you’re in the middle of nowhere can be a big problem. Manufacturers thought about this, so you have several options to choose from when it comes to batteries. Some tracking devices use disposable batteries (AA or AAA). This is very handy, because you can take a spare pack with you, and replace them on the go. However, this takes additional space in your pack and some hikers wish to avoid that. The alternative solution are rechargeable batteries, which you can charge at home or on the go. Some products give you dual battery options, since they can operate with both rechargeable or disposable batteries. Not many trekking GPS devices come with sealed batteries, because it takes time for them to charge. Also, you need to bring either a solar charger or a portable charger with you. Whichever battery type you choose, always consider how long they are going to last. They should last at least throughout the day, so you don’t have to worry about power mid-hike. Look for battery information when choosing your GPS and you will avoid trouble later on. Hiking GPS devices are designed to fit the palm of your hand, so they are very compact. While not many products in this category are large or heavy, some hikers are weight-conscious and want their GPS (as well as other hiking gear) to be as light as possible. If this is you, then you should know that smaller weight means that your unit is going to have a smaller screen and possibly be more difficult to operate because of this. You are going to have to make a compromise to some extent, and we think it’s smartest to find a balance between size and ease of use. In terms of screen size, a large display on your walking GPS will make it easier for you to see more details on the map. However, a larger screen will consume more battery power too, meaning they are not very energy efficient. The best hiking GPS devices come with high-quality color screens which show all the details on your map. On the other hand, some cheaper versions come with monochromatic screens which are more battery-efficient, but aren’t that easy to read. In addition, it’s a big plus if the device has a screen which can easily be seen in sunlight, and also good backlight so you can read information when hiking at night. Of course, devices with larger and better screens will be costlier too. GPS devices collect signals emitted by satellites orbiting the Earth, and use these signals to calculate your location and project it on the map on your display. Most commonly used system is the GPS (Global Positioning System) developed by the United States. In addition to this system, many products we featured use GLONASS system too, which is an alternative to GPS, developed by Russia. Both of these are available worldwide, and devices which use both have access to signals from a larger number of satellites enabling them to be more accurate and find your location faster, especially if you are in deep or covered areas. Furthermore, some devices are WAAS-enabled (Wide Area Augmentation System). This system was designed as an aid to the GPS, and it allows your device to compute your location with greater precision. While some people don’t require a device which works with these additional systems, it can certainly be beneficial in many scenarios. You have two options to choose from – a touchscreen or a conventional device with buttons. Some of us are used to touchscreens on other devices we use every day, so perhaps this type of handheld GPS will be easier to use. However, they can be problematic to operate when it’s raining or if you have gloves on when hiking in cold weather. While some products are compatible with gloves, a device with physical buttons can be more suitable and easier to use in these situations. On the other hand, models with buttons are often more durable and have a smaller chance to break. Some people find it easier to press buttons when going through options and menus, but a touchscreen is undoubtedly faster (especially when typing in information). It all comes down to your preference, and which type you find more comfortable to use. For your GPS device to be fully functional, you need to have some maps loaded on it. As you probably know, some devices come with pre-loaded maps, installed by the manufacturer. This is nice, but it often raises the total price of the product. Also, not all devices come with the same map quality. While some manufacturers install a high-quality topographic map, most products come with a basic 100k without much detail. If you get a device without any maps, or you don’t like the one you got, you have plenty of options to choose from and set them up yourself. You can find both free and paid maps online, depending on what you need. You simply connect your device to your PC and load the maps. Make sure you get a device which is compatible with various map types you intend to use. Also, the device should have sufficient memory, which we’ll talk about a bit later. Some products have additional sensors integrated inside which greatly increase the functionality. Keep in mind that not all products have these, especially those in the lower price range. As we mentioned, these sensors allow the device to display useful information – altitude and orientation. If a device is equipped with a barometric sensor, it can measure atmospheric pressure, using the same principle as an altimeter watch. Based on those readings, it can display change in altitude because pressure is lower in higher altitudes. However, these readings are influenced by changing weather too, because the pressure changes with it. Even though it’s not completely precise, it’s usually pretty close and you can get a good idea about elevation. Furthermore, some devices come with a compass inside, an electronic three-axis compass. This type is much easier to use than a standard compass, since it shows direction no matter how you’re holding the device (compared to a conventional compass which you need to hold horizontally to get a good reading). If you want to learn more on how all this works, read our article on how to use a compass. Another benefit of electronic compasses found in these devices is that they allow the device show heading even when you’re standing still, which isn’t possible for GPS devices without this sensor. As we mentioned, your gadget needs to have sufficient memory so you can load all the maps you want. Every product comes with internal memory – some have less than 1GB, while others have much more. It’s a big plus if your new outdoor GPS has expandable memory. This way you can insert a MicroSD card inside, and fill the device with all the things you need before going on a hiking adventure. But it’s not just about pre-loading maps before the trip – many devices also record useful information while you are on the hike. This information includes distance covered, tracking your route or waypoints, and you need to count this in when thinking about memory. If there isn’t a substantial difference in price, you should always go for a product with better data storage options. Some of the products we talked about are easy to pair and use with other devices – different GPS units or your mobile phone for example. If it’s equipped with wireless technology and compatible with devices other hikers use, you can quickly and easily share maps and useful information with other members of your group. In addition, if you connect it to your phone, you can receive notifications on your GPS, for example if someone sends you a message or if there’s upcoming bad weather. Finally, all products are compatible with your PC at home, and use a USB connection to transfer data. As a bonus, some manufacturers hand out their specialized software to make using and adjusting the device easier. Since GPS hiker trackers are designed to be used outdoors, they need to be much tougher compared to other devices we use. They should be made from strong materials that won’t break when you drop the device on the ground, which is bound to happen at some point. Furthermore, they should be shock-proof so the components inside don’t get damaged from the impact. In addition to build quality, the device needs to be waterproof too, since you will sometimes be caught in the rain or you will encounter humid conditions on your cross-country hike. Depending on the particular product and manufacturer, GPS devices come with various waterproof standards which represent different levels of protection. A number of added features can improve your user experience, and bring you some things you didn’t know you needed in the first place. We already briefly mentioned the wireless connectivity, which allows you to share information with others without using cables. This is usually done with a Bluetooth connection, but some devices also include ANT+ wireless protocol, to connect to other devices such as a heart rate monitor for example. Some devices have an integrated radio communicator, with a range of several miles. This way you can communicate with other members of your hiking party, or access NOAA weather radio broadcasts. To take this a step further, some navigators double as satellite communicators. This means you can send and receive messages, and call for help in wilderness survival situations. If you like taking photos, you will be glad to hear that you can get a GPS with a camera. However, these cameras are not as advanced as those we have on our smartphones. They can be handy if you don’t have your phone with you and wish to quickly take a photo. Furthermore, most devices can be used for geocaching, some even come with many pre-loaded locations to make the search easier for you. You can also load geocaching files through your PC, and most products will recognize and use them without problems. Q: Why Use Handheld GPS For Hiking? Can’t I Just Use My Phone? 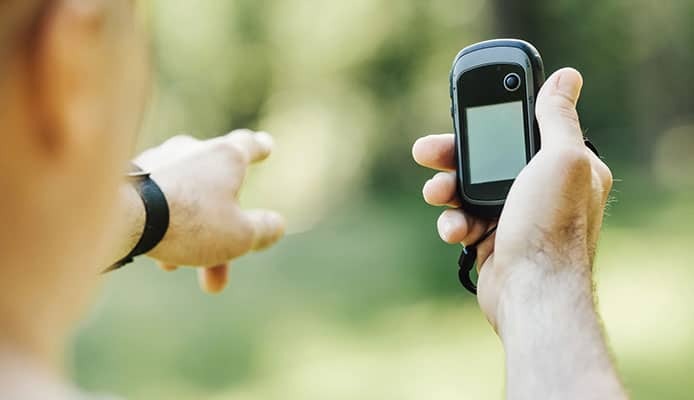 A: Both GPS devices and smartphones are popular among hikers and used for navigation. While phones are great in many situations and very easy to use, they were not specifically made for this purpose and have some downsides. The screen is bigger and you need to run a few apps which means that the battery will drain faster. Here we encounter a problem – you can’t simply replace the battery on your phone, you need to charge it. Also, many phones are not resistant to water, and may get damaged if you are backpacking in the rain. Handheld GPSes have this covered – they are more robust and resistant to outdoor conditions. They are also designed to work with maps, and can show your location, record routes and give you the information you need immediately, while remaining energy-efficient. Q: What Is A Mapping GPS? A: A mapping GPS is a device which shows your position on a map. Even though this is standard nowadays, it wasn’t so in the beginning. Early GPSes showed your position and certain waypoints, but you had no way of knowing the characteristics of the terrain ahead – whether it was flat or steep, and which type of obstacles you would encounter. Modern devices use detailed maps on which they project your position and path, so you get a much clearer image of what lies ahead. Q: Do I Have To Pay For Maps? A: This depends on what type of map you want to have on your device. We already mentioned that some products come with preloaded maps, which vary in quality. Like we discussed, you can get many maps online, free of charge. However, the best maps cost money and you need to pay for them. If you aren’t too demanding, then you will certainly be able to find a free map which will work great, and you’ll also save some money along the way. Q: Should I Use Rechargeable Batteries? A: Using rechargeable batteries is great, as long as they are replaceable and you have a spare set with you when the ones inside run out of power. This way your device can always have power while you’re using a more eco-friendly solution and avoiding disposable batteries. However, as we mentioned earlier, a sealed battery can be annoying because you need to wait for it to charge. Some of the best backpacking GPS units give you the option of choosing the type of batteries you want to use. Q: Is A Touch Screen Better Than Button Operated GPSes? A: We can’t say which one is better, because this depends on you as the user. Touchscreens are larger, easier to see and use, but they require more power too. On the other hand, some hikers prefer to operate their GPS using buttons. Furthermore, gadgets with buttons are often more affordable since they have a simpler design. A hiking GPS is a very useful piece of equipment, which will make navigating the trail much easier. It will also drastically decrease the chances of getting lost along the way. As you had the chance to see, there is a wide array of products available – ranging from basic and budget friendly options to more sophisticated products with large screens and lots of added features. Like we pointed out earlier, functionality is most important, so pick a product which will work best in your situation. Have fun and stay safe! Have you tried a hiking GPS that made it onto our list? Was it able to quickly pinpoint your location? How are you satisfied with usability and additional functions? Please share your experience with us in the comment section below.